Fall is my favorite time of the year and one of the reasons I’m wild about fall is PUMPKINS! I have not met a pumpkin that I didn’t want to take home and decorate. 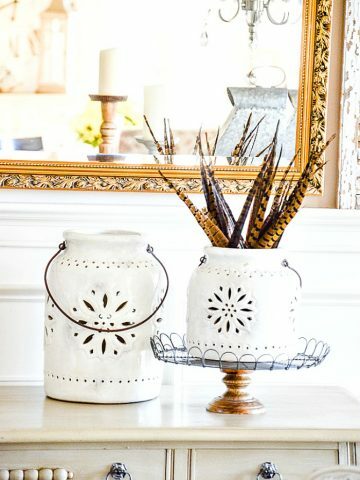 cook, embellish, make part of a vignette, or create a spot for! 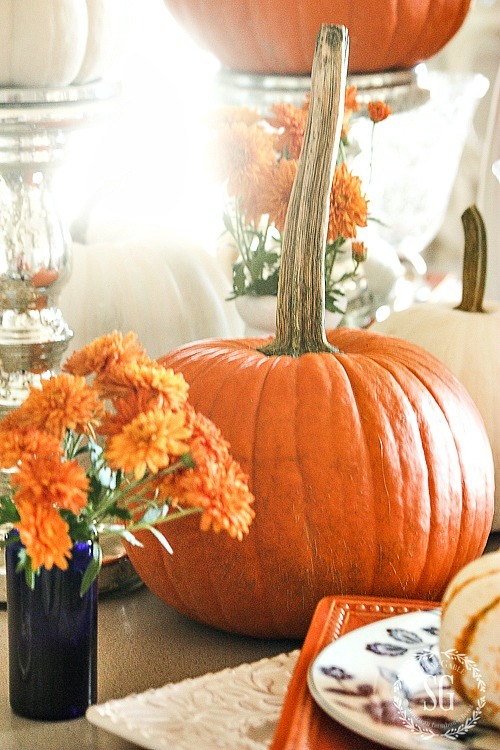 Today I’m sharing a pumpkin filled table to celebrate the abundant pumpkins of fall. The most common and brightest of all the pumpkins, the orange sugar pumpkin, is sharing the table with white baby boos, munchkins, pump ke mons, caspers and wee be littles! 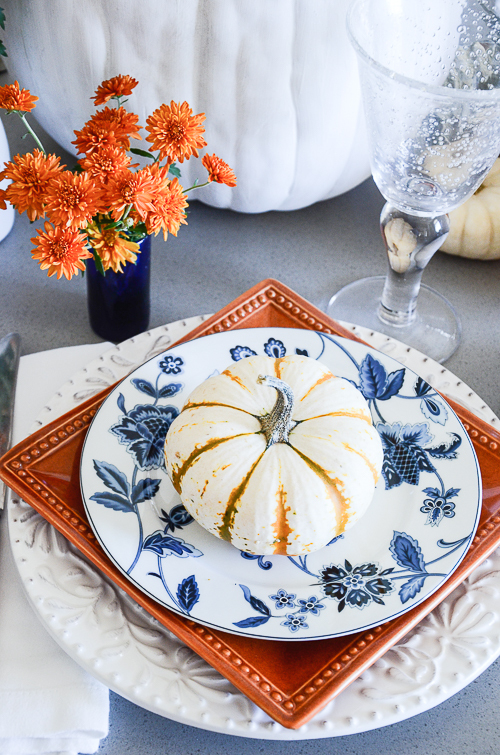 The pumpkins are set against blue and white dishes. 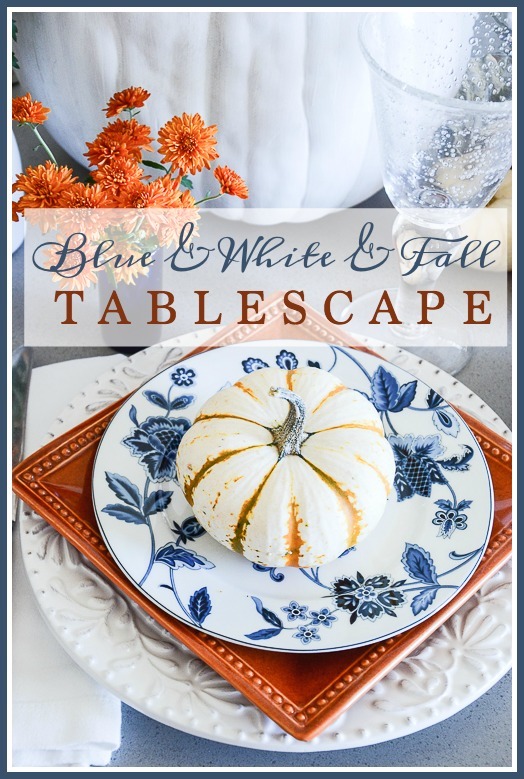 This is a blue and white and fall tablescape! I’m thrilled to be working with such a talented group of tablescapers! Make sure you find their links at the bottom of the page and head to their blogs for a tablescape visit! 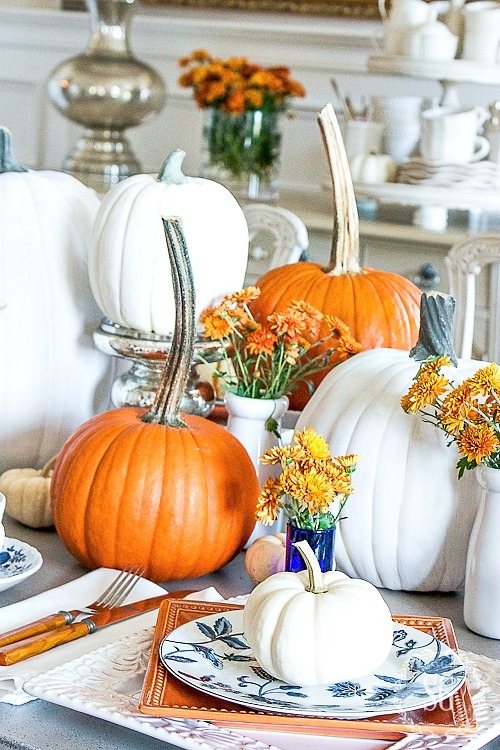 No tablecloth is necessary for today’s pumpkin-filled table! The concrete surface of my dining room table has a blueish tint to it and works with the other elements on the table. I really don’t like ironing tablecloths or runners! I’m a happy camper when a tablescape does not need one! Pumpkins grow like weeds in Lancaster Co. As I drive through the countryside there’s almost always a pumpkin field in sight. Just for your information… I call this my “artistic” picture! Don’t you love those funny long stems! I call sugar pumpkin like the one in the foreground of the picture above a “3-pound-pumpkin”. A pumpkin this size usually weights about 3 pounds and they are the best pumpkins to stuff and roast! You can find my favorite roasted pumpkin recipe at the bottom of this post. It is impressive, very easy and it is soooooo good! You might want to try it in a 3-pound-pumpkin! Pumpkins rambles down the center of the table. Some are perched on cake pedestals and some on candlesticks! And little white milk bottles are filled with orange mums ramble down the table along with the pumpkins! My favorite pumpkin this year is the pump ke mons! They look especially becoming perched on blue and white dishes! If you are not a fan of using orange in your home try adding blue and white to it. Those popular colors will magically make almost anything orange look stylish! It is a color combination that makes me swoon! See? Pumpkins top off a stack of dishes at each place. If you look closely not all the dishes are the same, but they blend together. Some dinner plates are round and others square and the top plates coordinate but do not have the exact same pattern. Not even the cups and saucers match! This is the most fun way to set a table! Little cobalt blue vases are filled with the last mums in my garden! Garden flowers are the best! Okay, the vases are really shot glasses. Who would know! Old vintage forks and knives sit together on a simple white cotton napkins. Doesn’t this flatware have fabulous handles? I remember them in my grandmother’s kitchen drawer! I love to think about how many times my grandmother’s precious hands touched these utensils. When I deconstruct this table I’m going to be making some scrumptious roasted pumpkins! Look at the inside… YUM! Your pumpkin laden table is decorated beautifully! Yvonne, you never cease to amaze me!! The whole table is eye candy to someone like me who so admires and appreciates a lovely place to sit my guests! In as much as I love all of it, I must admit I have a favorite! 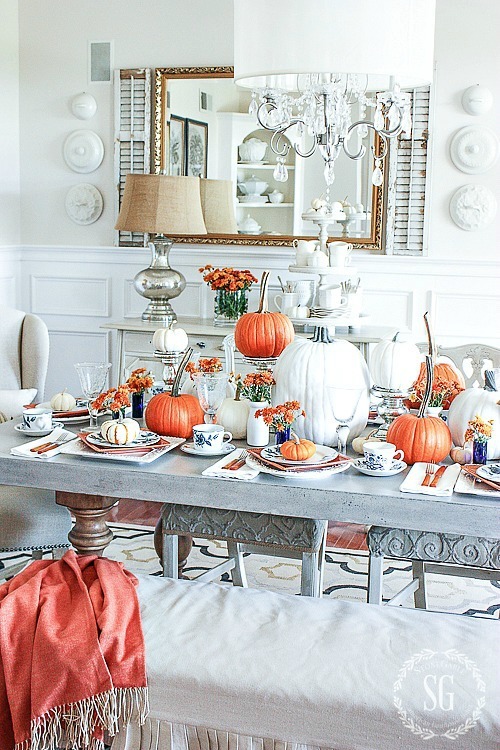 I now call your table the “pumpkin table” and I love the flat wear! The fact that it belonged to your Grandmother must make it priceless to you! The handles have such beautiful coloring for fall and they make just a perfect addition to all of the other fun fall elements. 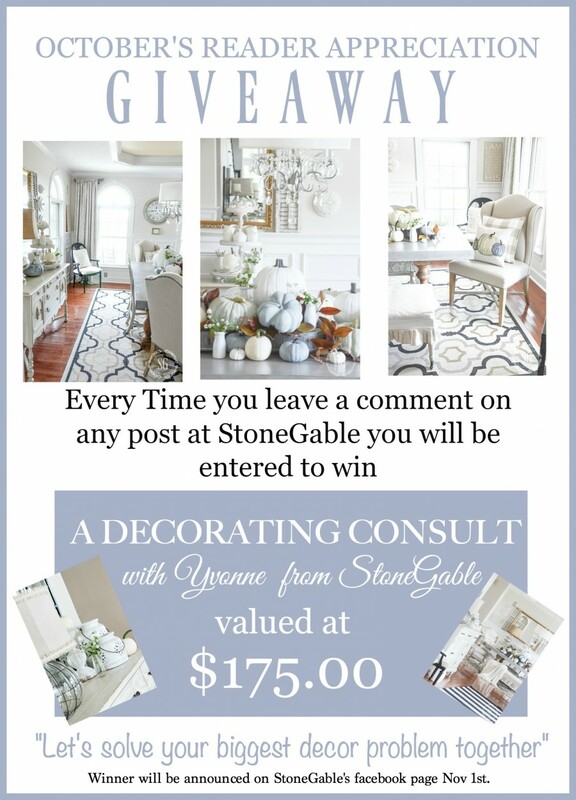 I know you will enjoy autumn at StoneGable! 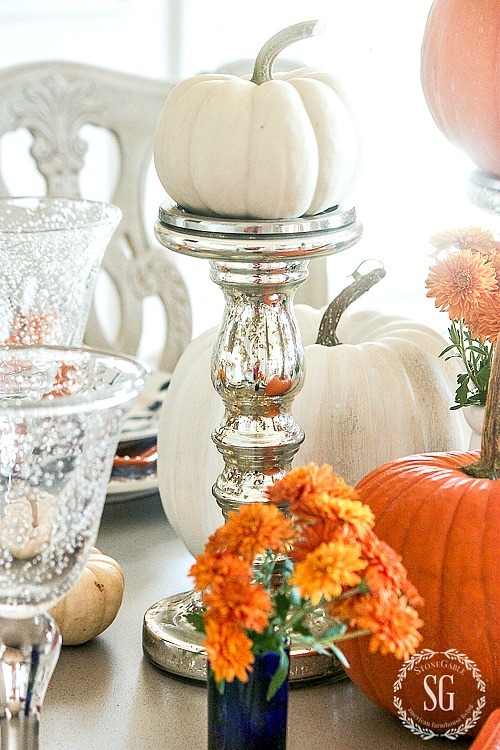 How could you not surrounded by all of your lovely fall decor! Thank you for sharing like you always do! You are kind and generous which is why I always return to visit you in your beautiful home, StoneGable! My mother was a strong believer that blue would work with any decor. She had a huge collection of blue and white and cobalt blue. I packed most of it up and have not thought about it in years…until today! I can’t wait to open the old chest and see what I inherited from Stella. Thanks, Yvonne for bringing back fond memories. I echo what the others have said about how pretty this is! I just keep seeing all those great pumpkin stems! 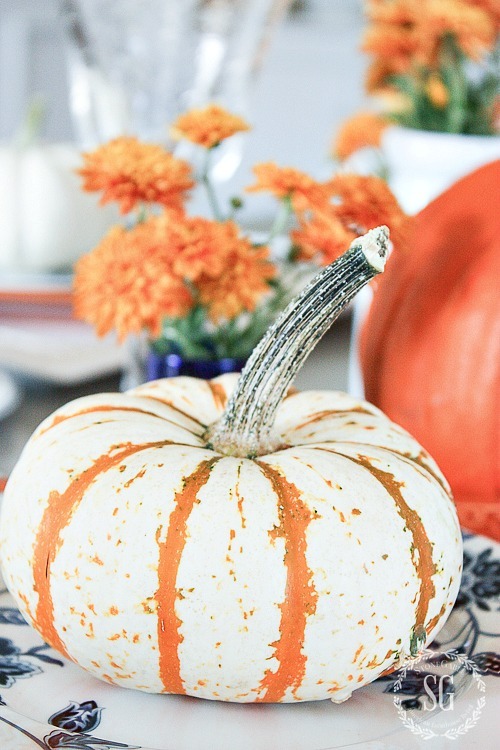 Do you cut them off and dry them at the end of the season to use on DIY velvet pumpkins the next year? Now when I buy pumpkins, I buy them based on what the stem looks like so I can recycle them into lovely velvet pumpkins. I really like the orange (or bittersweet) square plates mixed with the blue/white. 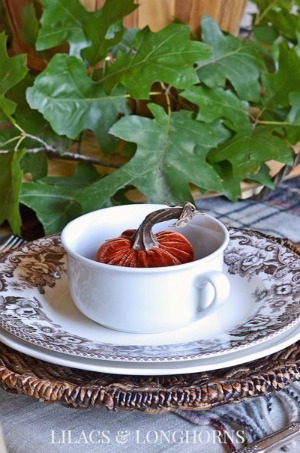 I bought some pumpkin plates on clearance last year to amend my fall table for this year. Have to get them unwrapped and washed! It is the beginning of autumn afterall. I laughed to myself when you talked about “cobalt blue glasses-well actually they were shot glasses” used for flowers. I save everything cobalt blue, down to bottled tea bottles. Just cannot bear to throw them away. I have always put my blue and white with orange, or really rust colors! I LOOOVE that combo…as you know:) Your table is beautiful. I set a VERY similar table in the dining room for Fall. I have pumpkins down the center of the table too, but they ate silver and gold:) I’ll be posting it soon. Miss you! 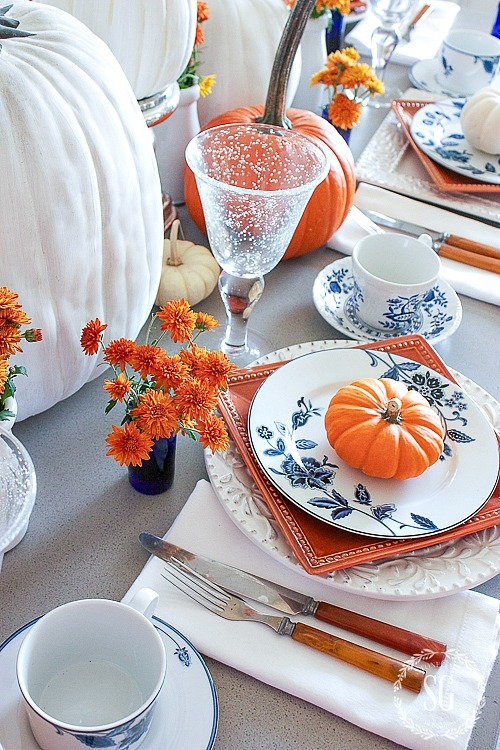 Love the blue & white table setting with the traditional orange for fall. I’m like you and have to have some orange pumpkins along with the white, and most of my home is decorated with blue & white. I have and always will love blue decor, been decorating with it most of my life. Unfortunately my dining room is a floral wallpaper from the mid nineties when we built our home and orange just doesn’t work in there. But it’s on the books for a reno very soon. We’re going back with some type of painted wood on the bottom of the walls and texture and paint on the top half. Can’t wait to be able to do more with my dining room! Love the post, the table looks so pretty, I have started to pick up a few blue and white pleases and cups and it so much fun to use them in my decor. Thanks for the inspiration . 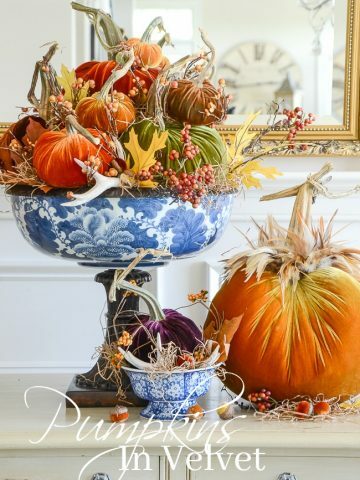 One of my favorite color combinations!….love the orange and blue!…gorgeous table Yvonne…I need to try to grow a pumpkin patch…then again…the deer would love for me to do that too! LOVE the blue/white with the orange! i still love orange pumpkins. your tablescape is spot on! love it. 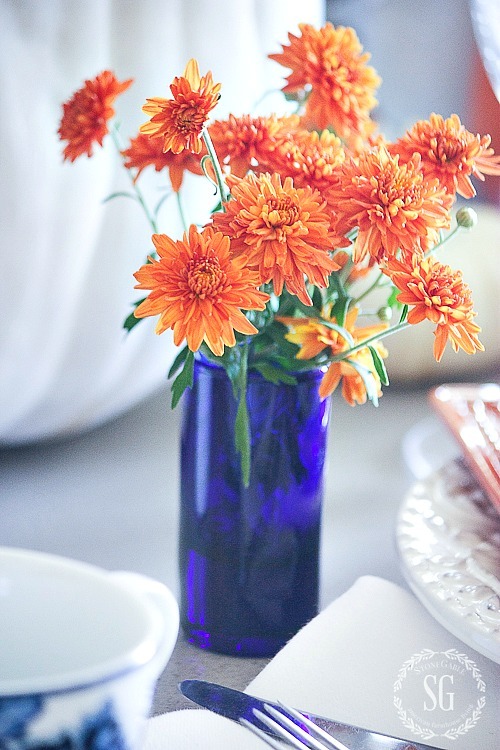 Once again another gorgeous table… such fun mixing colors and using the blue and orange. Beautiful and elegant, what more could one ask. Stunning -and such a fresh take on fall . You are a decor genius . How pretty! I am in love with Blue and white and I keep collecting more of it. I can’t get enough. The roasted pumpkin recipe looks yummy! I am going to try it when the kids get home! I could never dress my table that beautifully, well, not any time soon, with two very active grandsons. Watching one centerpiece crash to the floor last year was enough for me. The little guy has not mastered the “cloth removal without removing anything else” trick! Lol!! Love the cobalt blue and the square dishes, too! The flatware is awesome as well. Beautiful as always…you really do have exquisite taste. Yvonne, your table is just set so beautifully! Just love everything! You are an inspiration to all of us! Omg! The table looks so pretty and inviting! looking so pretty together with the Orange! So lovely … it’s so inspiring I can almost smell something delicious coming from the kitchen. Thank you for the wonderful ideas. Again, as usual. A beautiful table setting and the colors are beautiful. You can tell Fall is in the air. 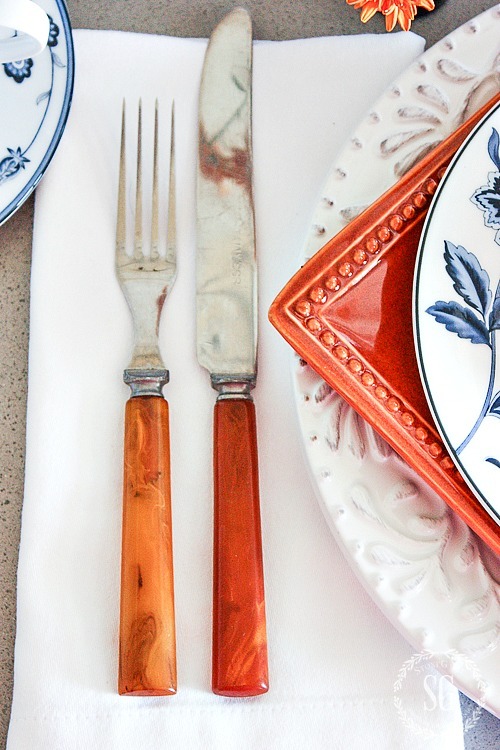 One of my favorite colors for table ware is blue and white. Looks so clean and can use just any color with it. Thanks so much for sharing with us. 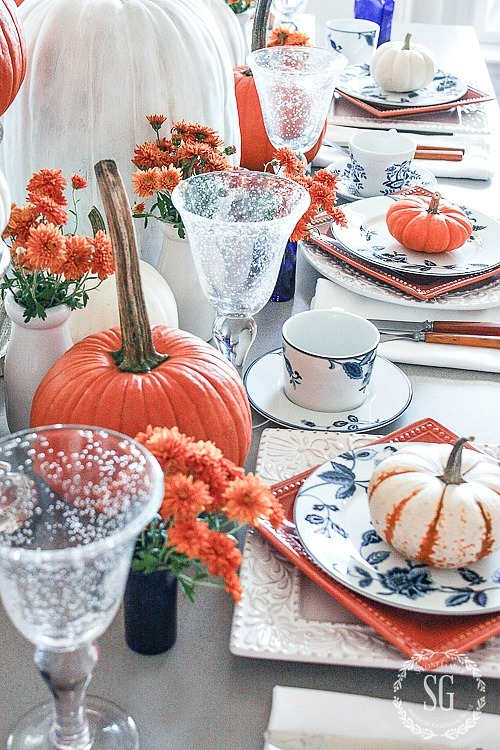 I love the blue and white theme with orange pumpkin. Trying to get blue in my house but my furniture and kitchen cabinets are dark. I just love the farmhouse theme! Any suggestions would be great! Try adding white accents like dishes, bowls, an old white breadbox etc. Hope this helps. that i have collected over the years, so iam doing this immediately! And the baked pumpkin with its ooey gooey deliciousness i cant wait to try! Love it!!!!! Love the blue and white. Just the perfect pop of color, although it almost acts as a neutral. It is beautiful with the orange pumpkins and goes equally as well with yellow, lime green and pink during other seasons. Your table is my idea of perfection. Your blog just makes me smile. Lovely! I’m really loving all the blue and orange. This has to be my favorite! Thank you! I love the table..especially the blue setting off the orange..works so perfectly together. May I ask what are the sizes of the plates you using? Besides a charger, the largest dinner plate I can find to buy separately is 11″ but it barely shows around the dinner plate. I’m at a loss, can you help? Thanks! gives the table some height,very pretty and happy. What a refreshing table Yvonne!! I love the way you used the orange mixed with cream and blue, so that it looks much lighter and crisper than it would if mixed with dark tones. It’s beautiful!! Love, love, LOVE! Blue is the main accent color in all my downstairs public rooms, so I have a little of it in every season. The oranges and blues together really pop. It’s a great contrast to the usual darker fall colors. Since I live in Florida, it’s a perfect color combination for me. I’ll be borrowing several of your ideas. Thanks so much for yet another beautiful tablescape! 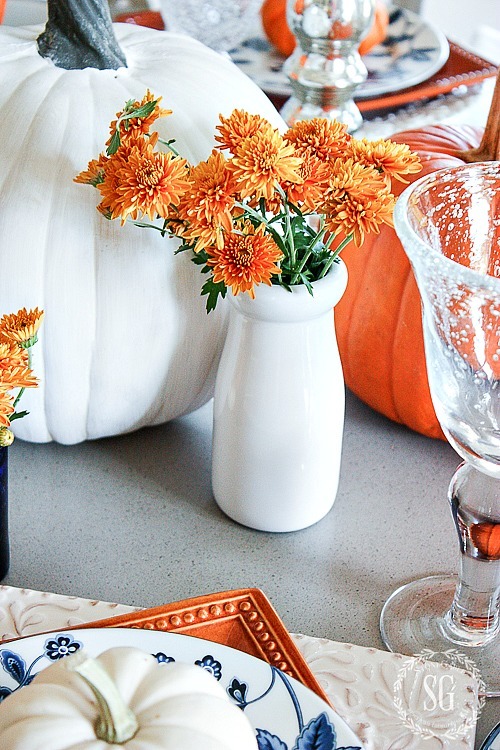 Love your table for fall, the Orange and blurs GO so beautiful together. You make it took elegant like a family could really enjoy a gathering together. Happy fall!!!! Thank you for sharing another beautiful, inspiring tablescape! I love your tablescapes along with all your other posts. Amazing Yvonne,I love your tablescape. The color combination is very welcoming and I love your garden mums and pumpkins. You are my go to girl for inspiration. Have a good day! I LOVE everything you & TINA create !!! 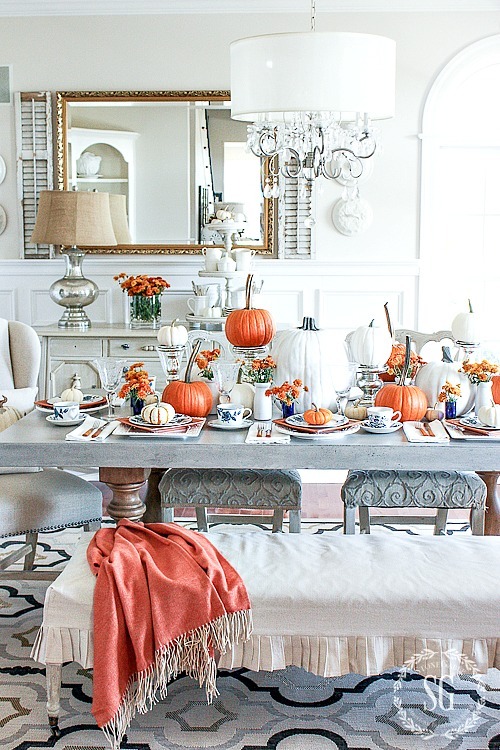 This is so pretty in white with the pumpkin-colors everywhere, even in the bench drape. Love the long stems on the pumpkins too. I want some !!! Sending love, Yvonne. I miss you !!! Stunning as always Yvonne. You go the distance and it’s always perfect. I love the pops of orange. Orange is my favorite fall color. Put together with your willow ware and its just beautiful. I love pumpkins too! Any kind, any color! I wish we had some of those Long-stemmed beauties in NC! Loving your tablescape as well! I found, the perfect white and blue handled silverware at my mother’s which would look great with everything on your table. I may have to use your idea as inspiration!! I love blue & white and your table is beautiful! And since we are big Florida Gator fans(orange/blue), adding the orange is wonderful! Love the cobalt blue small vases. They are stunning with the orange mums! I’ve always used yellow with blue but have just recently started adding orange accents. I absolutely love the two colors together. It is such a dynamic combination! Absolutely beautiful!! Do you happen to remember the name of the pattern of your white dishes under the orange and blue? Hi Lori, the dishes are called Indigo Bloom by Mikasa. Beautiful! Never thought to put orange with blue, but since they’re complementary colors it makes all kinds of sense. Those blue & white dishes are yummy…HomeGoods? Orange is not one of my favorite colors but I have to say that I love how you combined orange with blue and white! OH wow this is so pretty! Your “artist” photo is glorious! And I made your stuffed pumpkin recipe last year, and it was soo good. It will be on my table this year too! I am a quilter and there is an easy formula for a successful color combination as I am sure you know. White dishes plus your favorite color plus an accent in the complementary color always wors! Check the color wheel for that third hue. White plus red with a dash of green , for example. I think this is stunning. Now what would you do to make it useful for an actual dinner? 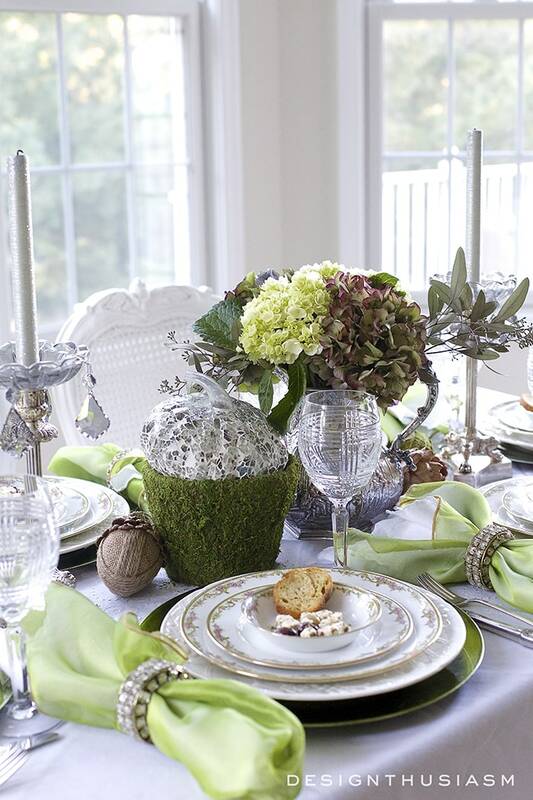 I see so many wonderful table settings but what does the guest do with the pile of plates or the ornament in the center? Would you leave the tall pumpkin? Or, are all these just for pictures? Yes, if you see above your question, Martha, I’m also wondering how Yvonne serves the food. I love the tablescape but just wonder if everyone helps themselves in the kitchen then sits down OR if there’s space on a buffet in the dining room from which food is served buffet style and guests help themselves. Just lovely, Yvonne! Like you, I adore blue and white pieces and equally adore collecting sets of different colored dessert/salad plates to add interest and a touch of color to the table. I have a question I hope you’ll have time to answer as this is always a dilemma for me … how do you serve the food when the table is already filled with the decorative pieces? Do you serve from another table in the dining room or does everyone serve themselves family style in the kitchen and carry in their own plate … or what? Thanks in advance if you can help me! Gorgeous!!! I’ve used on white pumpkins this year with my blue dishes-the blue dishes and orange pumpkins are beautiful! Can hardly wait to get some! Yvonne, your table looks gorgeous! For the Autumn Season, I love the mix of blue and white with orange…so pretty! I hope that you have a wonderful day!!! Happy Fall!!! FALLbulous Yvonne. You knock it out of the park over and over again. 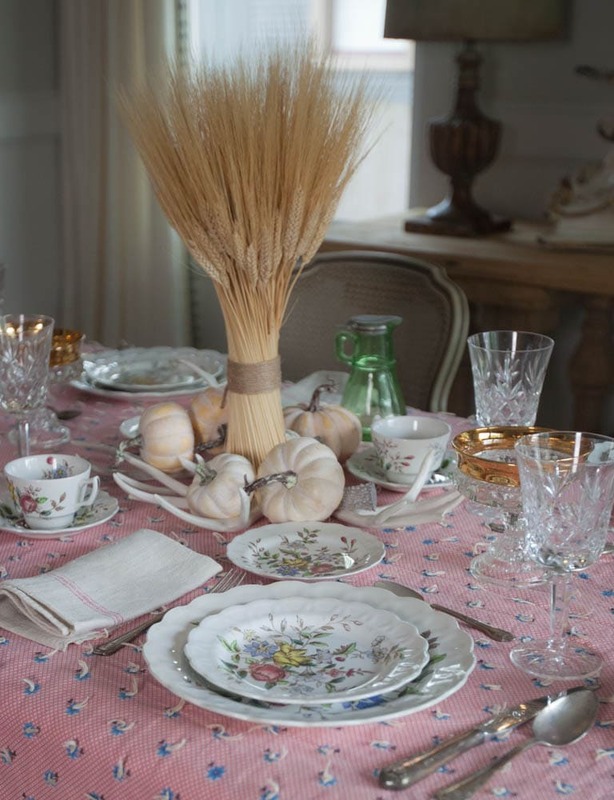 I adore this tablescape Yvonne! And the long stemmed pumpkins are what caught my eye and draws me in to the beautiful stacked dishes with that gorgeous little pumpkin. It all works so well together! But your grandmas flatware is just precious! I’m pinning this to my tablescape board!!! Your place settings are beautiful. Just the right amount of blue and orange. 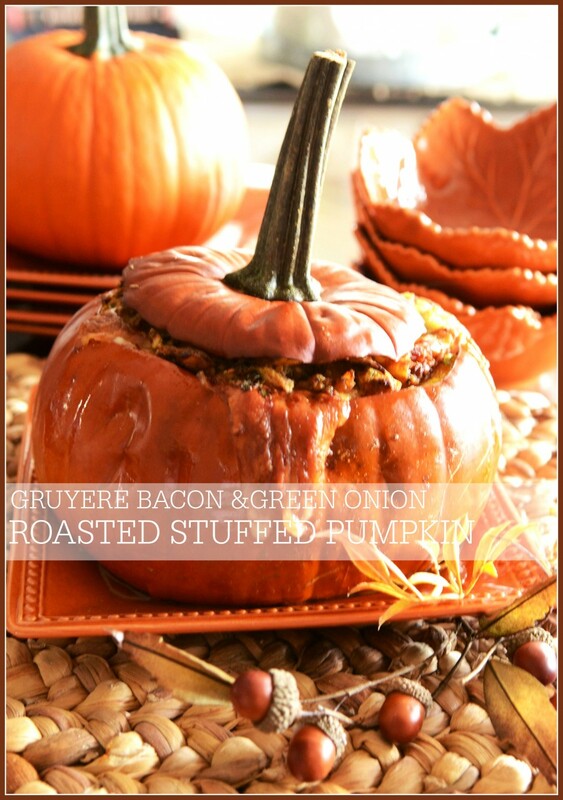 I am looking forward to making the stuffed pumpkin recipe this fall. It looks delicious! 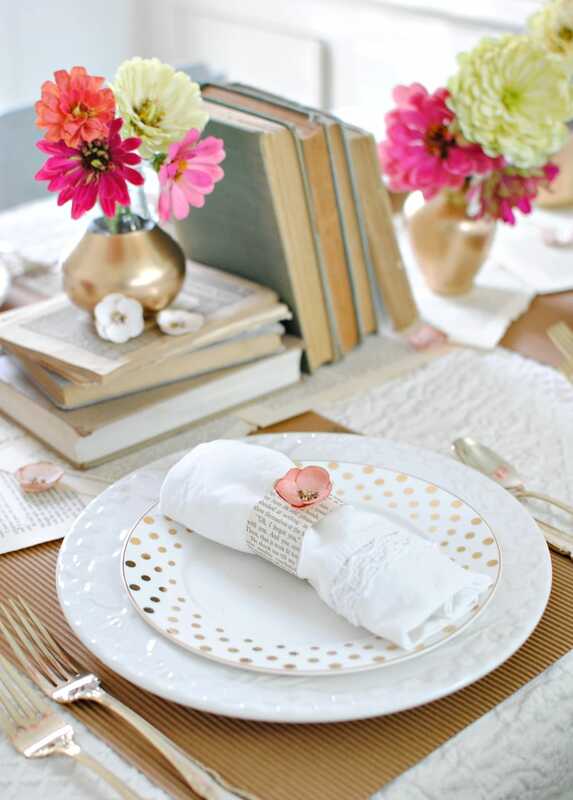 Love your pretty tablescape! I’m trying to channel your love for white dishes! Thanks for sharing that things don’t have to match because I’m working on Thanksgiving dishes and not all of them are going to match! But excited to see what I can create with them! Oh…and did I forget to tell you how amazing your table looks?! It does!! Yvonne, you’re a girl after my own heart! 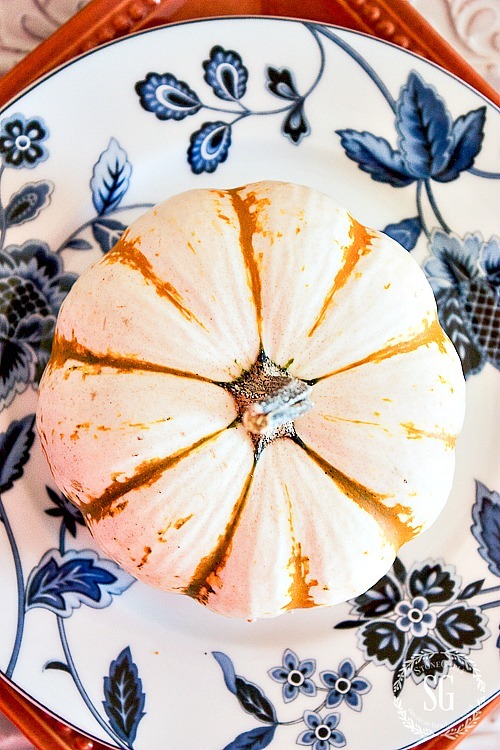 I adore pumpkins of all sorts and love them paired with blue and white — always stunning! Like you, I don’t like ironing tablecloths and runners either. Boo to the iron! Just between you and me I used Downy Wrinkle Release on my long piece of fabric I put on my table. It’s the lazy girls go-to when things are a bit wrinkled! lol I love your long-stemmed pumpkins — those are hard to come by here in Texas. Everything is shipped in from somewhere else so good stems don’t always make the journey. Wonderful touring with you, sweet friend! As soon as I saw blue and white I knew that I’d love this. You always knock it out of the park my friend! I recently hosted a tea party and you were my inspiration. I have white dishes that I got in Germany many, many years ago that were rarely used. Now I am using them for the backdrop to all of my other beautiful dishes that I have collected as well. Thank you! It’s so wonderful to visit your blog every morning and come away with a new idea! I love pumpkins and totally overloaded on them when visiting Lancaster County last week. I have them all over and was looking for a different way to show them off. I would never have thought of pairing them with blue and white. Brilliant!!!! Thanks, as usual, for you inspiration! Gorgeous…learned to love blue and orange @ Gettysburg College. I usually don’t like orange but you won me over, this looks amazing! Love the blue and orange color combo! Your posts are always so pretty. Just gorgeous! Love those blue & white dishes. What is the pattern, if you don’t mind sharing. The orange & blue are the colors of University of Florida! Go Gators! HI ANDREA! The dishes are from Mikasa. The pattern is Indigo Bloom. 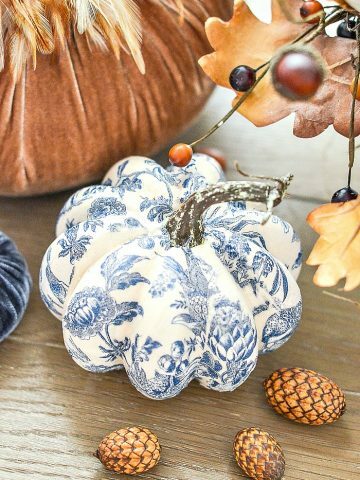 Love the blue and white with the pumpkins. Love, love, love the tablescape!!! I’ve never done a tablescape, but you have inspired me to give it a shot this Thanksgiving! Thank you! Your tablescape is beautiful and love the blue and white theme. I wish we had pumpkins all year around! Absolutely stunning, Yvonne! 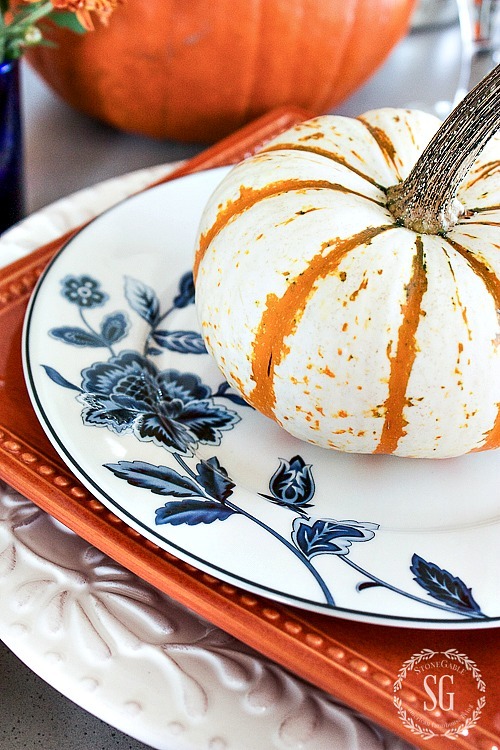 I adore using blue and white plates mixed in with oranges for Fall. The colors compliment each other perfectly. That table is so beautiful I can hardly stand it! Your tablescapes and vignettes are my absolute favorite. 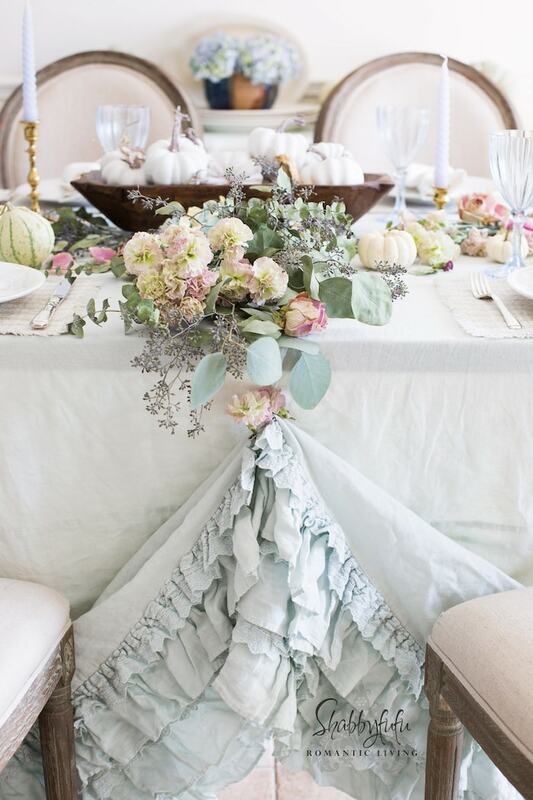 I love an inviting table for guests, or even just to decorate and enjoy it for yourself! It makes me want to pull out my Grandmother’s Blue Willow plates and set my dining room table up like this. I just might do that! LOVE IT! What is the name and maker of the beautiful blue and white dish patten? I love it! It’s gorgeous with all the other lovely things you did to make such a memorable tables cape. Thanks! Hi Mary, the dishes you are asking about is Indigo Bloom from Mikasa. 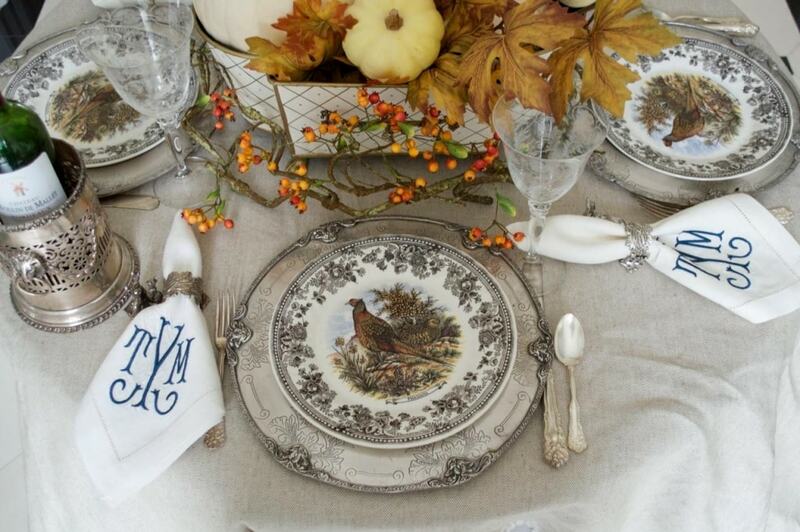 Yvonne, Love, love, love this tablescape. The blue & orange pair so well together and the colors pop. Beautifully done! Yvonne, you are my “go to” for beautiful tablescapes. The orange, blue, and white combination is stunning. As usual the detail is outstanding. Love starting off my day with you. Thanks for sharing your information on the variety of pumpkins. I am on a pumpkin quest now here in Florida. Love them. Nancy, looks like we start our day together. I love coming down to my computer with a good cup of coffee and interacting with my readers! Love from Pa! 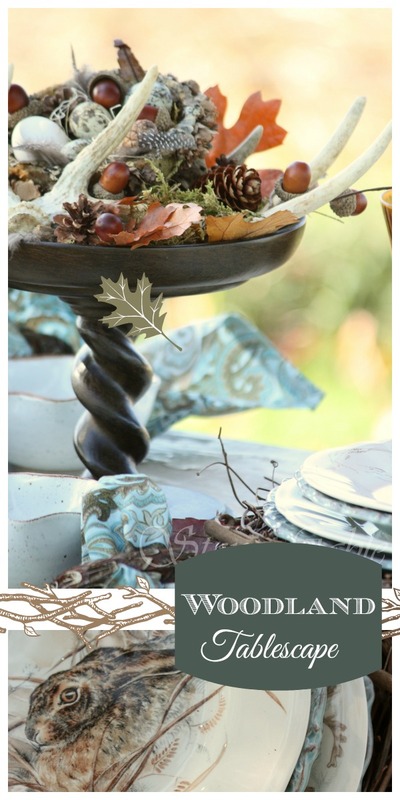 love the color combo on your beautiful fall table. 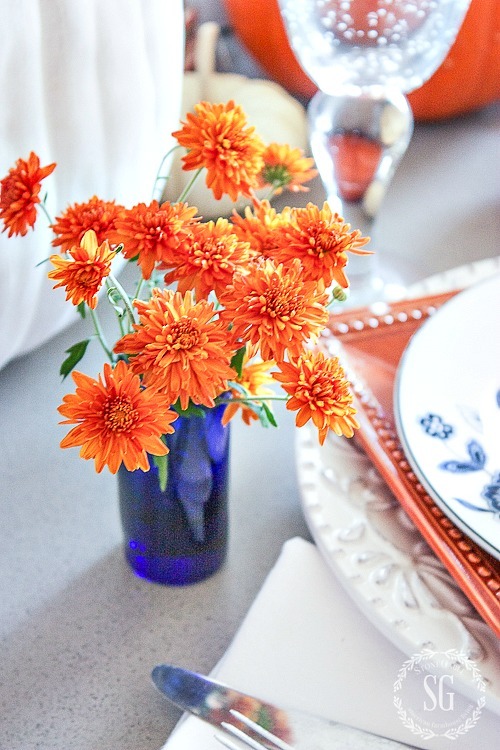 Love, love, love your orange and blue tablescape – so pretty! The color combination is really unexpected for fall, but boy, does it make a powerful statement on your dining room table! Thanks for sharing – I have several blue and white dishes and have pinned for future reference! Blessings to you….. Thanks so much Lanita! I LOVE my pinners!!!!!!! These are inspiring, I love fall and the cozy fireplace mantels, and pumpkin pie! Plus, I really need decor help. Hi Helen! You are in the right place! 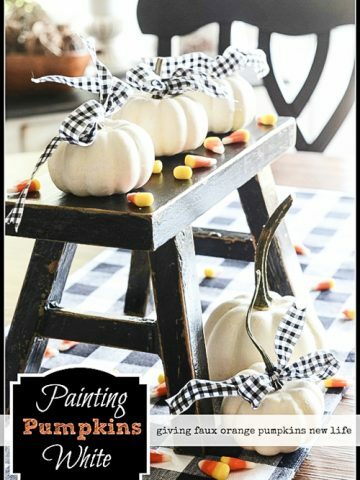 There are tons of decorating tips here! Hugs! You out did yourself Yvonne. I love it. I love the Orange and blue combination. I love the whole table arrangement, down to the littlest detail. Amazing. I love the blue and orange….how different! I recently painted my home grey and was having a hard time transitioning to fall because I am in love with the navy and grey. This is perfect!! By the way, love that silverware!!! Thanks for sharing! Bucknell University’s (‘Ray Bicknell) colors are blue and orange, and I have loved them since my brother, then 30 years later our daughter, attended and graduated from this Lewisburg, PA educational institution. I’m taken back to fun filled times visiting family at Bucknellhen I see these colors and LOVE them! Thanks for this wonderful decorating tips! You are the Queen of tablescapes! This is beautiful! The classy blue and white color scheme pops against the warm orange. Your design beckons like a warm blanket and makes me want to sit at this welcoming table. Have a beautiful fall day, Yvonne. Who would have thought the blue would look so great with the Fall colors? Beautiful, Yvonne! I’m crazy over blue and white and orange! Looks amazing every time! I agree! Was going to comment on the beautiful blue and orange colors but that’s already been said! Beautiful Yvonne love how the orange really pops on your table and you don’t need to know how I feel about the blue and white, to me it belongs in EVERY season….well done!! Tina, you are the queen of blue and white and those colors in your hands to the most amazing things! So fun to be working with you today!